Olive oil shares a number of similarities with wine in terms of production. Like grapes, the humble olive is often hand picked, usually in the latter months of the year before being pulped and pressed. These days, individual high-quality oils, known as extra-virgin,are often discussed in the same reverential tones as certain wines, and are branded with equivalent standards of quality, known in Italy as denominazione, which serve as a guide to the consumer. There are also different varieties of olive which lend their ownindividual characteristics to the finished oil. The key to harvesting is picking the exact time that maximum yield of oil can be achieved without too high a level of acidity. Too pale a shade of green and acidity will be low but the amount of oil may be negligible; too dark and there may be plenty of oil but the acidity will render the oil unusable. Olive oil is now big business across the whole of the Mediterranean with Italy and Spain making claim and counter-claim as to who is numero uno. To meet this demand, mass-market brands are produced on an industrial scale with high-capacity machineryfulfilling the role once undertaken by a humble millstone and a press. As such, it is the means rather than the method that has evolved with time, although there are organic producers who prefer to produce oil using traditional methods because they feel itpreserves more of the integrity of the finished product. 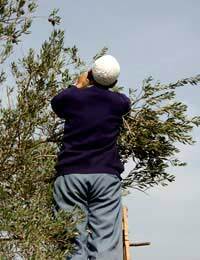 The process begins with the picking of the olives which then have the stem and leaves removed before washing to rid them of any dirt, and in the cases of some producers pesticide residue. Storage usually lasts no longer than 72 hours before the olives andtheir pit, or stone, are then ground into a paste which is achieved using a stone mill or metal grinder. The next stage is the pressing, which serves to extract the oil from the paste. Modern hydraulic presses now more efficiently achieve the same resultsas the more humble lever or screw press, while big producers utilise centrifugal decanters that leave the heavier flesh clinging to the outside of the drum while the water and oil is channelled out through the centre. Centrifugal force can also be utilised to separate the water from the oil, alternatively a gravity decanter facilitates the process more naturally. Big producers store the oil in stainless steel tanks prior to bottling. Temperature is vitally important during the production process. Heating the paste prior to pressing increases the yield but can impair the flavour of the resulting oil. As a result European Commission guidelines state that use of the term "first cold pressing" on a label is only possible if extraction has taken place below 27 degrees centigrade using traditional methods. Similarly, if centrifugal machinery has been utilised the same figure must be adhered to in order to label an oil "cold extraction". Olive oil is produced throughout Italy both on a large and small scale. The fruit itself prefers a temperate climate and as such the most prized oils come from areas that enjoy these climactic conditions. These include Liguria, Tuscany, the Veneto and Umbria. @Polly. This seems strange to find in the UK as regulations are quite stringent in terms of product descriptions. Here the information you need about olive oil regulation and inspections . Have used what I believed to be virgin olive for years, well known brand, only to find that 70% of brands contain little olive oil and are low grade blends of cheap other oil. Is there a guaranteed way I can safety buy 100% quality virgin olive oil? Thankyou.